WIT, F. DE - Nova europae descriptio. Title : Nova europae descriptio..
Map maker : WIT, F. DE. Size : 17.5 x 21.9 inches. / 44.5 x 55.7 cm. 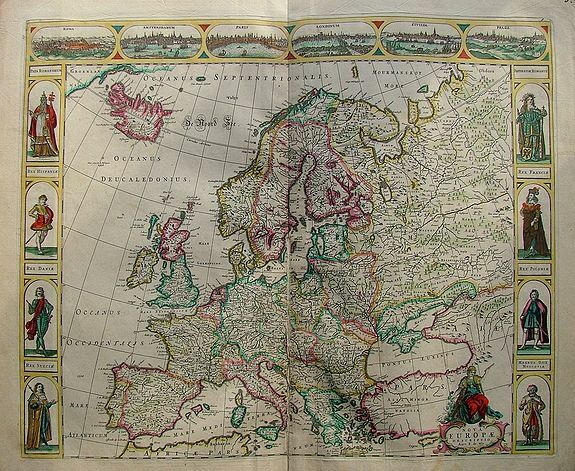 Description :An attracting "carte à figures" map of the European continent. In the top there are six views of: Roma, Amsterodamum, Paris, Londinum, Sivilla and Praga. At both sides there are four figures in national costume of the roman empire, Danmark, Sweden, Moscow, France, Spain and Poland. Condition : Split and browned along centerfold.